There are thousands of Ant species worldwide, it is said that Australia has at least 10% of that number. Ants being social creatures live in colonies, mostly in permanent nests working cooperatively together for the benefit and protection of the colony. They are seen in and around foundations, brickwork, woodwork, paved areas, rubbish bins and often invade homes and buildings, on walls and into kitchens, contaminating food left on benches or in food handling areas. 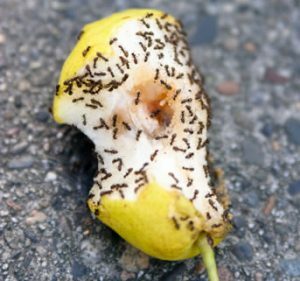 If you need to get rid of Ants, you need a Pest Controller and we are here to help you with Ant removal, give us a call now. Ants are scavengers eating a wide range of food products and in dry periods, searching for water. A professional Ant exterminator, Control-A-Pest Pty Ltd, can provide you with assistance in Ant extermination. Some Ants, like Bull Ants can also cause medical concerns with their painful stings or bites, which in some people can cause severe allergic reactions. If you have a problem with Ants, call us here at Control-A-Pest Pty Ltd for advice and Ant treatment, contact us now.